Linear Tube Audio are - we’ll be frank here - not the most well-known audio brand. They are geeks, and they make geeky toys for geeky customers like us. But that doesn’t mean they shouldn’t be better-known, especially when they release an amp as mind-bogglingly good as the MZ2-S. In this review, we break down the MZ2-S’s sound, design, packaging and accessories, specs and more. To see how it stacks up, read our list of the best headphone amps. Linear Tube Audio, the makers of the Linear Tube Audio MZ2-S, are a Washington, DC company who have been making phenomenal amps for a long time. Mark Schneider, their head honcho, began working with audio whiz Dave Berning in the 1980s, developing a technique in 1996 known as Zero-Hysteresis Output-Transformer-Less amplification (ZOTL). We don’t really want to go into exactly what this involves, mostly because we can see you drifting off already, but the upshot is that it’s informed the company’s products ever since, and has largely set them apart as an amp maker of superlative quality. They are best known for their MicroZOTL range, of which the MZ2-S is the latest version. The differences between this model and previous ones are largely internal, and start with the power supply, which has had a full makeover with an upgraded regulator. (Our review unit did not have this upgraded regulator installed, but we can certainly appreciate how it would make things different). In addition, having an external power supply significantly reduces operational noise. That’s a big deal, especially when you’re dealing with sensitive electronics. We never heard any audible noise coming out of this amplifier, even after long periods of operation, and at high volumes. It’s miraculous – and very much in contrast to some other headphone amps we’ve tested. That’s without talking about the heat it generates, or lack thereof, thanks to the low-current ZOTL circuit. After three hours of listening, it was still only mildly warm to touch. When you consider that most tube amps get uncomfortably hot after a while, that’s quite something. Here’s the thing. We listen to a lot of audio equipment here at TMS. There’s a constant train of gear trundling in and out of our offices. But this is one of the few pieces of gear which we were actually sneaking off to listen to on the weekends, or late at night. The sheer joy of realising what it did to our music collection, having to wait for it to heat up, sliding on the headphones knowing - knowing - that we were going to hear something special, was just a revelation. What does it sound like? It sounds like a gift from God. That’s what it bloody well sounds like. It’s not just that we could hear every single element in the mix of whatever we listened to. It’s that every single one of those elements had an indescribable richness to them. No matter what we threw at it, it continued to treat each instrument like a precious, fragile jewel, something to be wrapped up in layers of soft velvet. 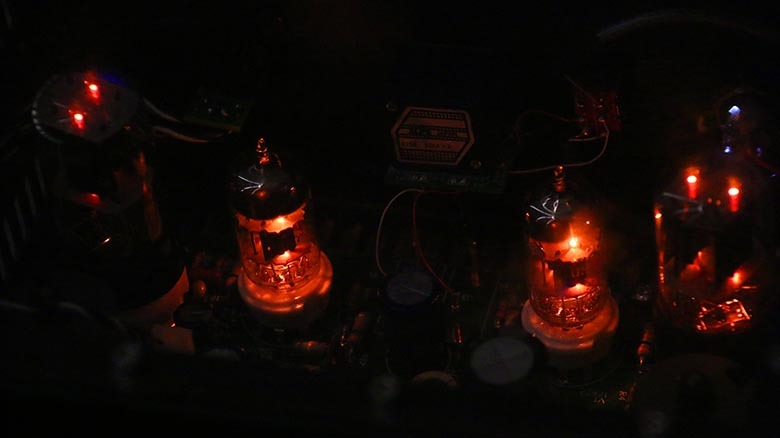 As tube amps go - and you can read more about the difference between tube and solid-state amps here - it was glorious. We know, we know. You’re supposed to be clinical and scientific when assessing an amp. But we’re not detail-obsessed audiophiles here. If you tell us that this amp is a Class A unit that uses radio frequency to change the voltage current transfer characteristics of the output tube, we will nod and smile, but we won’t actually be moved. But in the face of the sheer audio goodness this thing puts out, it’s difficult not to be. It’s almost impossible not to slip into hyperbole. It worked on just about every headphone we used on it, and this being TMS, we had quite a few to pick from. At 2Ω output (1 watt at a 4Ω load) it’s capable of driving pretty much any dynamic and planar headphone. In the end, we settled for our Beyerdynamic DT 770 Pro (80Ω) cans as our default, mostly because they didn’t color the sound at all. Why would we want them to, when the MZ2-S is painting the music in just about every color of the rainbow? If you aren’t into tube rolling, you can skip this entire section, but briefly, here’s how things break down. The MZ2-S ships with a set of stock tubes – a pair of Russian Tung-Sol 6SN7s, to be precise. We absolutely adored the sound of these, and thought they were highly flattering to our music. You can however opt to add in different tubes – a pair of NOS 12SN7s, at no extra cost. We didn’t test it with these, but we did swap out a few of our own tubes here and there, and while it change the sound in subtle ways, we still found that the original tubes were the most attractive. If you want to know more about tube rolling, we’ve got an entire guide dedicated to it. The front – which is available in both black and silver – is a nice slab of brushed metal. It’s highly photogenic: so much so that we used it as a cover photo on our Facebook page. There’s a volume knob, a 6.3mm headphone port, and a nifty input selector. We did have some trouble with the power switch: it’s set flush with its housing, often leading to accidental half-presses. When the lone complaint you have about a unit is that its power button is fiddly, you know you’re dealing with something good. And having said that, perhaps we’re being a little unfair, calling it unremarkable. (Update: LTA have said they’ve switched suppliers and design for their power button, although we haven’t tested the new version ourselves yet). The top is where the action is at. A clear plastic cover shows you the inner workings, including four gorgeous Russian Tung-Sol tubes. You may not be familiar with these, but take it from us: they are absolutely some of the finest around. Although they don’t have the overt glow of something like the Woo Audio WA7 Fireflies amp, they still emit a nice orange light when heated up. The cover is removable, and tube rolling (switching out existing tubes for ones you pick yourself, in order to customise the sound) is straightforward. We know this because when the unit arrived, one of the tubes was completely cracked. No fault on LTA’s part – they’d packed the unit carefully, and quickly sent out a replacement tube. You shouldn’t ever have to roll the tubes, which are of beautiful quality, but it’s nice to know that the option is there. Round the back, you’ve got two stereo inputs, and two always-on speaker outputs. The amp only puts out one watt of power, which is remarkable enough in itself, but it can quite comfortably drive any speaker over 90dB in sensitivity. We tested this, and it works like a charm. You also have a comprehensive selection of RCA inputs, as well as a preamp out. Essentially, this is a fully featured headphone amplifier, with everything you’d expect to see – including the ability to moonlight as a very competent speaker amp. You also get a range of options at checkout, including the ability to choose your cable length and power supply. There’s also the option to include a remote, but we did not have one of these available for testing. Very little to report here – certainly the packaging was nothing to write home about. The MZ2-S came in a very standard cardboard box with foam inserts, designed to hold the amp in place. The tubes came fully inserted – and given how one of them arrived cracked, this might not be the best solution for shipping. However, we accept that we were probably in the minority here. As for accessories, again, very few. We’ve already mentioned that we didn’t get the remote to test, and outside of the cable, the only accessory was the included power supply: a black box that sat behind the amp. It’s pretty simple and straightforward to operate, and outside of being a little bulky, was absolutely fine to use. The Linear Tube Audio MZ2-S delivers absolutely superlative sound quality, with real tube richness. The transparent top and slick front end look fantastic. ​It is able to power both any kind of headphones, and many different types of speakers, making it truly versatile. It’s quite expensive for an amplifier, meaning that it may be out of many people’s reach. We had some issues with the power button on the MZ2-S, although we accept that this has been fixed in subsequent updates. ​It’s a dedicated tube amplifier, which means the sound is not going to be to everybody’s taste. Solid-state fans should steer clear. If you are particularly interested in tube rolling, but you want to experience the tube sound nonetheless, then you might want to check out a Hafler HA75 (full review here). While it’s very hard to swap out the stock tubes, you get an unbelievable amount of fine-grained control, including the ability to blend the left and right channels. Unlike the Fireflies and MZ2-S, you can’t power speakers, so be aware of that. It costs roughly the same as the Fireflies, at $999, so you could happily choose between the two depending on how much control you want. If you want something with a serious sense of style, then we’d suggest you check out the Pathos Aurium. It’s a delightful amp with an art deco aesthetic that really stands out from the crowd. Sound-wise, it’s comparable to the MZ2-S, with perhaps a little bit more warmth and presence to the low-end. It’s a Class A tube amp, and gives you a wide range of options for rolling your own. It is slightly more expensive than the MZ2-S, at $1,495 to the latter’s $1,295. The MZ2-S is the only headphone amp offered by Linear Tube Audio, unfortunately, so we can’t recommend another one of their models for comparison. Let’s wrap up, then, by recommending a tube amp that is absolutely insane: the PrimaLuna DiaLogue HP. Like the MZ2-S, it’s a combination headphone amp/stereo amp, and like the MZ2-S, it uses tubes. Only instead of the two you get in the MZ2-S, you get a whopping eight to play with here. The sound is phenomenal – although at over $4,000, it had better be. Definitely one for the enthusiasts!